We now have PuddleCatchers Cloth Diapers in stock! Made entirely of snuggly soft, super stretchy and utterly absorbent baby knit terry. Two layers of terry in the body with an extra 4 thirsty layers in the soaker area. Snap closures make laundry day a breeze and provide an ultra-adjustable fit. Pair them up with our snap-in doublers for older infants and toddlers for an even greater absorbency with minimal dryer time. 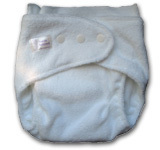 The body of this cloth diaper is made entirely of ultra soft, super stretchy and incredibly comfortable microfleece. 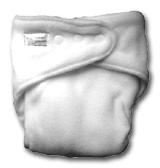 The microfleece wicks moisture away from baby's bottom and into the absorbent terry soaker, leaving skin dry and rash-free. This cloth diaper is perfect for over night, and those times when you can't change baby for a longer period of time. Six layers of terry in the soaker make this cloth diaper incredibly absorbent. Snap closures make laundry day a breeze and provide an ultra-adjustable fit. Pair them up with our fleece topped snap-in doublers for older infants and toddlers for an even greater absorbency with minimal dryer time, while keeping baby's skin moisture free. Is your baby a heavy wetter? Do you need to make a long car trip? Does your baby wake up soggy? Make your diapers work harder and longer with our snap in doublers. 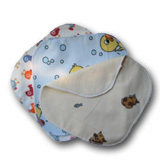 Doublers add extra absorbency to your diapers without adding any extra dryer time. 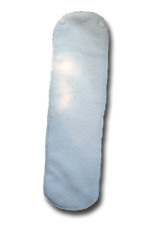 3 layers of plush thirsty baby knit terry are absorbent and soft next to your baby's skin. Snaps make change time easeful. Just snap-in the doubler ahead of time and your diaper is ready to go! Is your baby a REALLY heavy wetter? Does your baby have sensitive skin that is prone to rashes ? Does your baby wake up when they feel soggy? The same great doubler as our terry doubler but with the added pleasure of fuzzy soft fleece to keep your baby dry and comfortable. The microfleece top layer traps moisture away from your baby's sensitive skin, to keep them feeling dry and comfortable for longer.3 layers of absorbent terry make your diaper do twice the job. Doublers add extra absorbency to your diapers without adding any extra dryer time. Snaps make change time easeful. Just snap-in the doubler ahead of time and your diaper is ready to go! A sweet printed flannel on one size and soft fuzzy sherpa terry on the other, these 2-ply wipes make clean ups a cinch. Sized at 7"X7", these wipes fit perfectly into plastic wipes containers for use with our PuddleCatchers Wipes solution. 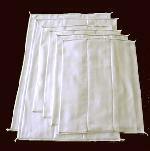 When stored moist, these thick cloths are just as convenient as disposable, and always on hand. Sherpa terry grabs up dirty messes while being gentle on delicate skin, while the flannel side is great for the finishing touches. These wipes are so thick, one wipe per change is all it takes! "Never fear spoiling children by making them too happy. Happiness is the atmosphere in which all good affections grow." PuddleCatchers Diapers work for babies of all sizes and shapes! You never need to buy more than one set. This diaper grows with your baby straight through potty training! 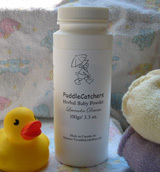 Click here to see how PuddleCatchers work to adjust to your baby's size. 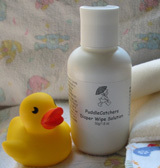 Find out more about PuddleCatchers Diapers and how to cloth diaper your baby! "Treasure the short sweet time in which you are everything to your child, and indulge his wish to be everything to you. " You will save an average of $1500 per child in diapering costs by choosing cloth over disposable diapers. The average baby will spend about 25,000 hours in diapers, and need about 6,000 diaper changes before they are completely toilet trained! Imagine, by cloth diapering you can keep 2 tons of biohazardous waste from the landfills! That sodium polycrylate, that icky gel that is found in disposable diapers and on your baby's bum when you change him has killed children who have ingested as little as 5 grams of it? Cloth really does make sense. Want to learn more? A very generous bar of pure soap, the kind that your grandparents and great grandparents likely used when scrubbing out their laundry by hand. This soap is gentle to your baby's skin and contains no harmful irritants. It is lovely for scrubbing out those hard to tackle stains that just don't seem to come out any other way than good ol'fashioned scrubbing. To view our great selection of diapering skin care products such as our all natural diaper balms, powders, and lotions, please visit our Baby Bath and Body Care section.